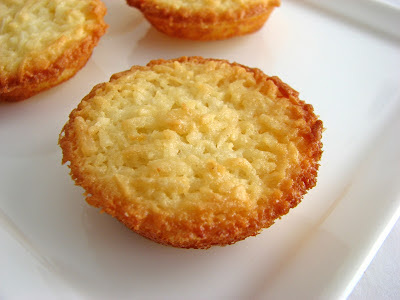 This time of year makes me think of coconut and these mini coconut cakes are every bit as light as spring. They take no time to make and provide a plateful of simple and delicious little bites. My version of Coco au Miel is based on a recipe from Parisian bakery Moulin de la Vierge. I’ve added salt and vanilla, more honey and less sugar, and I bake them at a much lower temperature to keep them moist and to prevent the coconut from scorching. They have lots of coconut flavor without any oversaturated sweetness. 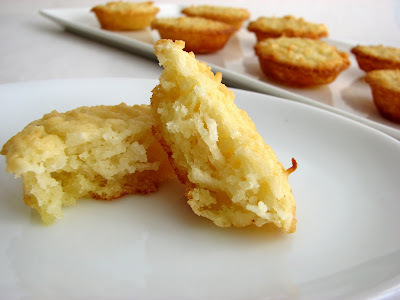 These mini French cakes are very much in the same tradition as Financiers and Madeleines - soft and chewy little nuggets of superb flavor, perfect any day of the week. - This batter is very liquid in texture, so make sure you keep stirring to distribute the coconut evenly as you scoop out the portions. - You can add additional flavor to the batter, such as a tiny splash of almond extract, Grand Marnier or kirsch. Or drizzle some melted chocolate on top or dip half of each cake in melted bittersweet chocolate. 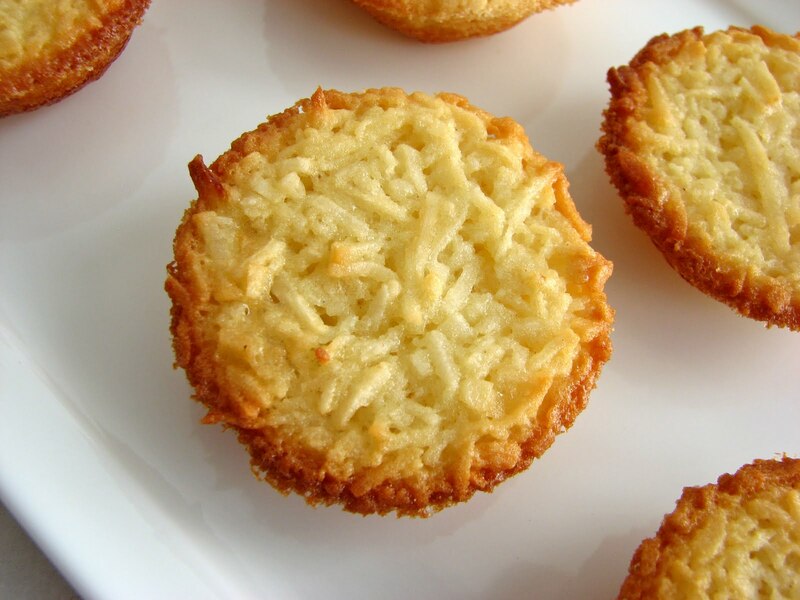 - Baking them without cupcake paper liners allows them to form crunchy chewy edges and develop more flavor. Preheat oven to 350 degrees. Grease mini muffin pans with individual wells that are 1 3/4" diameter and 1/2" deep. Bring the milk, honey and salt to a simmer over medium low heat, stirring to dissolve the honey. Remove from heat and cool. Whisk together the coconut, sugar, flour and baking powder. Add the vanilla and the eggs to the cooled milk and whisk until well combined. Add the dry ingredients and mix thoroughly. Scoop into mini muffin pans, filling to the top edge. (Note: If your mini muffin pan has individual wells that measure a bit larger than 1 3/4" diameter and 1/2" deep, fill each well with only 1 tablespoon of batter and watch them closely as they bake.) Keep the batter stirred so you are sure to distribute the coconut evenly. Place the mini muffin tins on a baking sheet and bake for about 15 - 18 minutes or until the tops spring back when lightly touched. These look delectable - and easy to make. I now eschew all types of non-stick pans even for baking. Do you too? Would that change buttering the muffin tin? Linda Dannenberg was the roommate of a friend of mine after they both finished college. Small world, n'est-ce pas? Can you use coconut milk instead of cow's milk? This would allow me to make a non-dairy version - important for those who keep the kosher dietary laws. Hi Victoria! Yes, I use old-fashioned baking pans, never non-stick. You definitely have to grease the pans well or the cakes will stick. I used canola oil because I was thinking that the cakes might brown too quickly with butter, but they will probably taste much better with butter and I think I'll try that next time. Interesting tidbit about Linda Dannenberg. This was one of the first cookbooks I bought when I finished pastry school. I think it's mesmerizing. Ben-David, I don't see why you can't use coconut milk. I think it's a brilliant idea! They would probably taste super coconutty. Let me know how they turn out if you try this. ummm, i think you may have forgotten to add in the vanilla extract into the recipe...also.. do the cakes shrink when they cool? Thanks, Anonymous. I've amended the instructions to indicate adding the vanilla to the milk mixture. I didn't notice them shrinking as they cool. One of my favorite bakeries finally closed, after the father retired. They had the best coconut chews, similar to this. It was the subtle sweetness of the honey that I loved so much. I don't have a mini muffin pan, but I'll figure something out. I simply must try these, because I have all the ingredients and it looks easy enough. Gorgeous photos! These look delicious. I love everything coconut. Can't wait to try baking these! I can't wait to try these! Such a nice springtime treat! Yum! I haven't ever seen these before but am a huge fan of anything coconut so I will definitely give these a try! My daughter gave me that cookbook a while ago. It's lovely. And these coconut gems look delicious. Think using coconut milk as one of the commentors mentioned is a great idea. I use it in my coconut bread all the time. Oh! These look so good. I have to make these. Beautiful presentation. I'm not usually a big coconut person, but those look amazing. This is one of my favorite snacks. I'm so excited to try this at home. Thank you so much for sharing. This is the first recipe from this blog that did not turn out at all. I think either the mini cupcake pans used by the author were much smaller than mine, or the recipe should NOT call for filling them up to the top. The yield for this recipe is supposed to be 48. I got 19. My mini cupcake tin has cups that are easily 2" deep. I filled them to the top, the tops browned, but the cakes themselves didn't really cook through. I think next time, I'd fill them only half full and try to get more. Easy to make... and tasty. But not what I was hoping for. saturday mike, thank you for your feedback and my sincerest apologies for the confusion. I guess there are many, many different versions of "mini muffin" baking pans out there. I'm sorry I was not more specific. My pan measures 1 3/4" diameter x 1/2" deep. I'll amend the recipe and be more specific in the future on all my directions for baking pans. Thanks for the response (and you don't have to post this). I just measured my cupcake pan, and the cups are about 1 1/4" deep. They were tasty, and people liked them, but they were a funny combination of macaroon and custard. Anyway, no worries. I'll make them again and just fill the cups half way. Like I said, it's the first thing I've made from your blog that wasn't really great... and I've made a lot. Your blog is very inspiring!! saturday mike, I now understand the predicament. I really do need to be more explicit in my directions. I can add a line that says there should be about 1 Tablespoon of batter for each cup. These really are little bites. I bought my little 1 3/4" diameter and 1/2" deep pans a long time ago and it looks like these types of pans have since gotten bigger over time. I appreciate the opportunity to improve my instructions. By the way, I have regrettably had to resort to moderating comments on my blog because I started getting bombarded with some very offensive spam. I do post everything that relates to my blog and am grateful for the time and energy my readers take to respond.